Safari Floormats Bring Back Memories of Your Last Jungle Expedition. 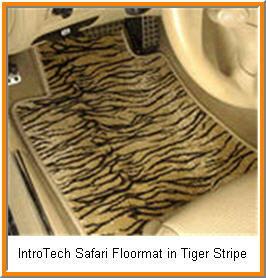 Your Safari Floormats are calling out to you! If you listen attentively you can hear the Cry of Tarzan as you drive down the road with your toes buried in the deep jungle of your Safari theme floormats from Intro-Tech . These mats are made of extra plush 114 oz. polypropylene carpeting that’s stain resistant and long wearing. They are double serged around the edges to prevent your jungle animals from shredding them. A nibbed backing prevents these mats from slipping on your vehicle’s carpet. 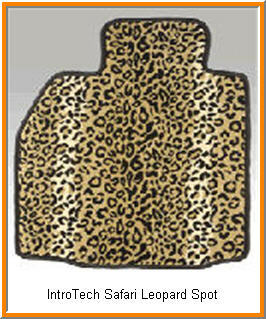 The Safari car mats come in two designs – Leopard Spots and Tiger Stripes for the animalistic needs in all of us. Now, do you hear your car roar? Of course we all know that not everyone is wild enough or brave enough to put Leopard or Tiger patterns in their car. So for the more conservative and possibly less adventurous of you, IntroTech Car Mats makes a plethora of other types of car floormats including leather, diamond plate, ultra plush carpet, sisal, coconut husk and clear vinyl.